Trankey Micro-Tech Corp.is one of the branch from Zing Ear Group who invests this company for mainly producing Circuit Breakers and partly producing electrical switches. 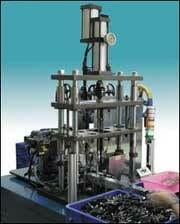 Since 1991, Zing Ear Group has transferred all Circuit Breakers production to Trankey Micro-Tech Corp. Copyright 2011, TRANKEY MICRO-TECH CORP. All rights reserved.